Heading out of town on business or taking the family on a well-deserved vacation? As much as you would love to bring your four-legged family member with you, this may not be possible. Whether you just need to leave your dog overnight or longer, we offer a number of boarding options. Our highly trained team has a passion for caring for dogs and will treat your pup like one of their own. Our team will give them the play, care and attention they deserve. Your dog will be happy and healthy when you return. Many boarding centers leave their canine guests in crates for most of their stay with little time for play. We realize that dogs are social animals; that’s why we set aside 10 hours a day for play plus additional night play for our overnight guests. Our trained team makes every effort to ensure your dog is as comfortable and happy as possible during their stay. We encourage our customers to bring their dog’s own bedding and food. Whether you’re just need to board your dog overnight or longer, our center has you covered. For many dog parents, leaving their fur baby can be a stressful experience. That’s why we offer webcam access so you can check in your dog using any device with internet access. Watch them have fun and make new friends at your convenience. We pride ourselves on providing a safe environment for dogs. 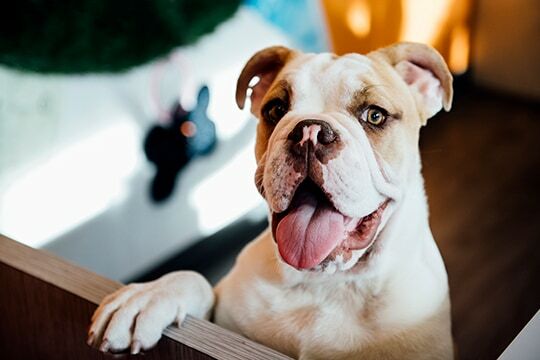 Before we book any dogs for an overnight stay, our team will meet with your dog to determine if they are a good fit for our open play environment. We also require that all dogs that stay with us have up to date vaccinations and be free of ticks, fleas and other contagious illnesses.